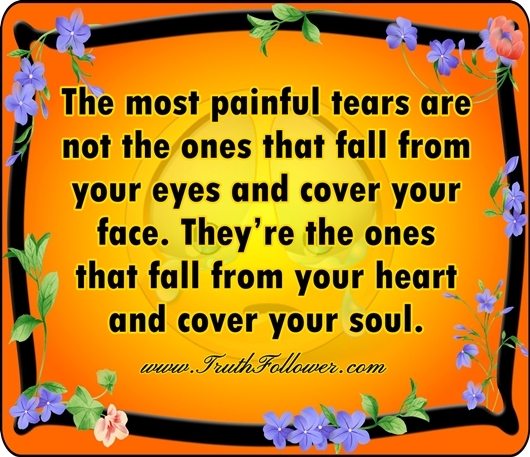 The most painful tears are not the ones that fall from your eyes and cover your face. They’re the ones that fall from your heart and cover your soul. A strong person is not the one who doesn’t cry. A strong person is one who is quiet and sheds tears for a moment and then picks up the sword and fights again. I may not be the best looking. I’m not rich. I don’t have a perfect body but I have a good kind heart for those who care. The most painful tears picture/image is an Inspirational Stuff to Inspire and Motivate You. You can download pics by just clicking on the Images. Thanks for visiting Truth Follower an online place for huge collection of inspiring pictures, quotation, and Sayings Images. If you like The most painful tears, Please Share with friends and family on Facebook, Twitter, and Pinterest.